For decades, it’s been assumed that BC was the cannabis capital of Canada. But new research shows that the city with the highest consumption of cannabis per capita is actually Halifax, NS. Statistics Canada launched a study in March using the new field of wastewater-based epidemiology (WBE). That’s right: city sewage. When users consume cannabis, the body metabolized the active ingredient THC into THC-COOH. Scientists can measure THC-COOH in wastewater to determine how much cannabis each person in the area is consuming. During the study, researchers took samples from 15 wastewater facilities in five metro areas in Canada: Halifax, Montreal, Toronto, Edmonton, and Vancouver from March to August 2018. 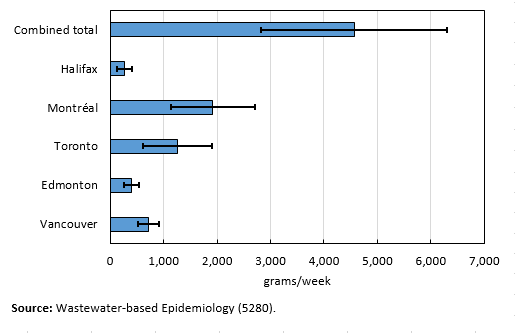 Based on these measurements, Halifax had the highest consumption with an average of 1,310 micrograms consumed per person per week. Vancouver was actually the lowest at 288 micrograms. It was also difficult to measure metropolitan areas precisely. Halifax’s wastewater facility is in the city core, so it may not represent the whole area. Other bigger cities have multiple facilities situated throughout the area, which could perhaps influence the results as well. Other factors that could impact results include “differences in temperature, acidity and the presence of industrial chemicals or bacteria in the sewer system” as well as the potency of the THC in the first place. StatsCan said that this is likely the largest WBE study in Canada, and one of the first – it is actually called a pilot project. WBE has been used in Europe before to measure drug use by city there too, including one study in 2007. The study was originally commissioned to compare with self-reporting results of cannabis use. StatsCan suspected under-reporting of the then-illegal drug, and wanted to find a more accurate method of gauging cannabis use.